This is one of the classic and most professional gimmick from Magic but now with Vernet Quality. 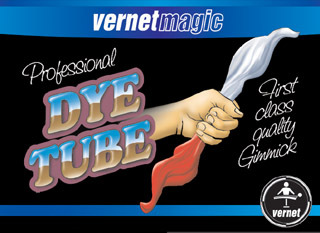 With the Dye Tube you will be able to change the color of a 14 x 14 inches silk. The magician shows his hands empty and takes a silk from his pocket. Now he put the silk on top of his fist and begins to push it inside. Then he takes the silk by the bottom of the fist and begins to push it out. In doing this the audience can see that the silk is changing his color. The magician finished to push put the silk and show in a completely different color. -Ideal for Close Up or Parlor Magic.